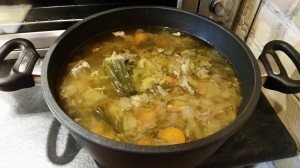 Bone Broth Soup | Dr. CECILIA de MARTINO, N.D. 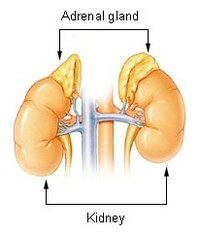 Your adrenals are two glads located above your kidneys (back side). They make the stress hormone cortisol. During periods of high stress (like back to school, work, family drama etc) the adrenals are working hard to deal with stress. Over time, the adrenals get tired and you may experience adrenal fatigue or burnout. A great way to nourish your kidneys is through diet. Specifically bone broth soup. In Chinese medicine it’s important to have a proper balance if yin and yang. Bone broth is great at nourishing yin and chi (vital force) as well as the Kidneys. Since the adrenals are part of the Kidney system in Chinese medicine, eating bone broth soup will also benefit the adrenals and will improve the immune system. Put all of the ingredients in the pressure cooker and turn the heat to high. Once you hear it steaming, it has reached the top temperature. Turn the heat to low and let it sit on the stove for 1-3 hrs. Then release the pressure before opening the pot. Add some cooked sprouted rice, quinoa or even some beans or lentils to the soup if you wish. I recommend eating this soup as often as possible through the fall and winter. Stay warm and enjoy!